After a wet and windy start to the first two days of the Auckland International Boat Show, the fine weather returned for the weekend with visitor attendance up on both Saturday and Sunday setting a new show record in its 11 year history. When the show closed at 6pm on Sunday, it had welcomed 19,000 people through the gates, just 500 down on last year. 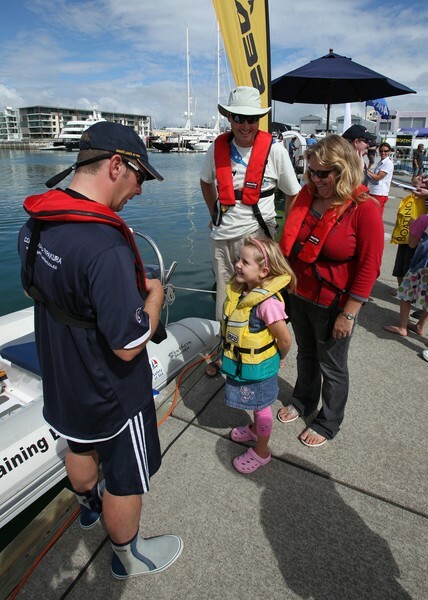 “The show demonstrated that boating is a real part of many New Zealanders lifestyle, and the boost in sales generated by the boat show has instil confidence throughout the marine industry,” says Peter Busfield, Executive Director Marine Industry Association. Throughout the Boat Show exhibitors reported a steady flow of visitors eager to buy equipment for their boats, refit their boats or even buy a new boat. Shane Walker, managing director of The Moorings, said the recession may even have prompted some people to be more active in their boating. “The marine industry is quite well poised for those who step up to the challenge,” he says. “If people have money in the bank, it’s no use to them. It’s only earning low interest and they aren’t going to play the stock market or put it into real estate. In this day and age, boating is one of the things that the whole family can do together.” Walker sold a Moorings Leopard 4000 sailing catamaran at the show and said he was “flat out” with enquiries for shared ownership arrangements in boats. His company provided the show’s gate prize: a week for two on a 40-foot yacht in Tonga, including flights. Another major success story for the boat show was from Rayglass Boats which had sold six boats by Saturday afternoon, totalling around $1.7m. Rayglass’ Scott Little believes people can see there are good value opportunities in boating and they are keen to take advantage of them. Tim Porter, general manager of the show’s major sponsor, Boating New Zealand, admitted to some nervousness going into the show. “We’ve been the show’s major sponsor for eleven years and feedback from exhibitors is that it was the best organised Auckland International Boat Show ever and a welcome boost to the industry.” He said Boating New Zealand also had their best boat show ever, selling record numbers of subscriptions, including many to newcomers to the magazine. Lance Fink, managing director of Hamilton-based Tristram Marine, described the show as “really, really positive”, with ink on paper confirming sales on three of the big Grandeurs in his range, and deposits expected in the next few days. He also reported strong interest in the bow rider models. Allan Keane of The Marine Brokerage says the level of enquiries at the show was “excellent”. He says one of secondhand boat is under contract and he also has “strong further possibilities” on other boats. While keen boaters braved the weather on Thursday and Friday, the boat show also attracted families on Saturday and Sunday. Sunscreen sprayers, courtesy of Auckland City Council, kept the kids sun-smart; a new bridge operated between the two sides of the boat show with shorter waiting times, and the al fresco style Sky City Pacific Café provided a carnival atmosphere with live music. Six-year-old Holly Padfield who has recently sailed out to New Zealand from UK with her parents Paul and Morag, couldn’t stop smiling as she watched her mother expertly take the Coastguard boat around the slalom course. The Coastguard demonstration was part of its interactive seminars held in the Cruising and Safety Hall, which included Metservice, Whitings Power System, Maritime New Zealand and Line 7. Another new concept at the show was in Pavilion Six where the MIA had made available space for boating clubs and associations to promote their type of boating. SailAbility took advantage of this with two boats, a Liberty and a Skud 18. Paralympian hopeful Tim Dempster was there to encourage those with disabilities to try sailing and to explain how new technologies can be adapted to enable even severely disabled persons to go sailing.